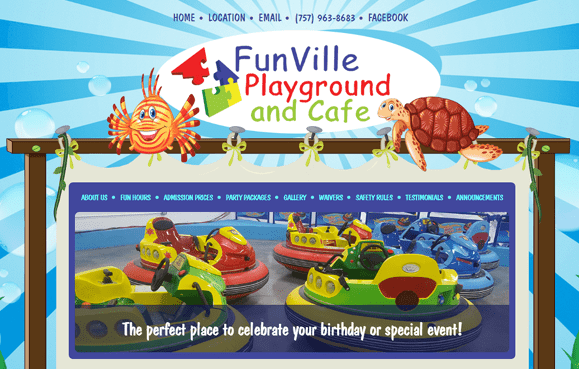 Website Design Entertainment Venues | Once you land on the main Fun Ville custom designed home page you may choose to visit the Virginia Beach or Chesapeake VA location. The pages contain color website illustrations to reflect the fun filled mood and tone of the business. The website also features a handy online location finder and easy-print forms to confirm party reservations. When searching Website design Virginia Beach Virginia look no further than VISIONEFX for all of your website needs. Great design elevates web sites above the rest of the crowd by having a look and feel that stands out against all the humdrum web design seen online today. The custom Photo Shop design for Fun Ville Playground and Cafe Virginia Beach has bright colors and illustrations of sea creatures as a nod to its location in Virginia Beach. All web site reservation forms also feature customer friendly PDF printing and display. VISIONEFX creates great web design for small businesses in Virginia Beach VA.